During Lent, observers of the Greek Orthodox religion abstain from meat, including beef, poultry, and many types of fish. This practice is observed in Roman Catholicism and some Protestant denominations of Christianity, too. Restricted foods can also include eggs and dairy products and stricter adherence can also limit the consumption of olive oil and wine. While it can be daunting to plan meals excluding these ingredients, it does not mean that you cannot enjoy a wide variety of tasty and delicious dishes. From warm and delicious white bean soup to traditionally stuffed grape leaves, there are plenty Lent-friendly Greek recipes to make this holiday season. And, do not forget about dessert, check out a separate list of ​Lenten sweets and desserts that you might want to try. 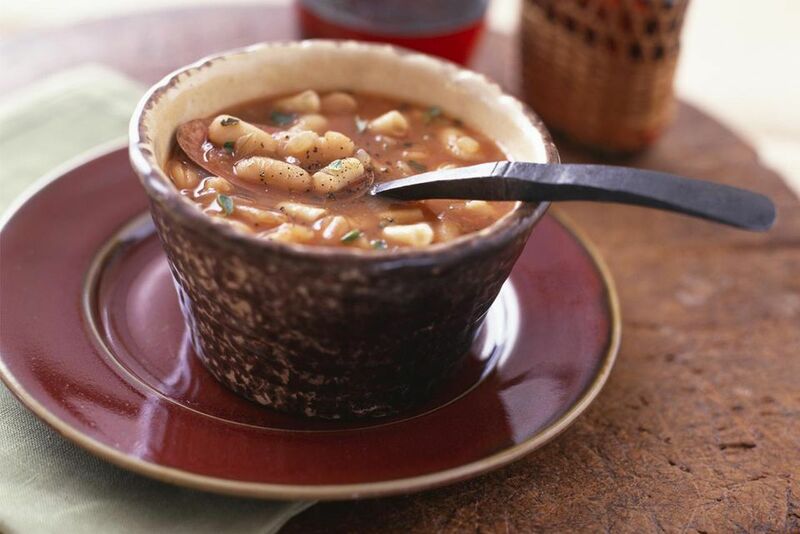 This classic white bean soup is a staple of the Lenten season. This recipe serves six to eight people and is hearty, nutritious, and delicious. These boiled leafy greens are easy to prepare, and when dressed in a bit of olive oil and lemon, you will enjoy the clean, pure taste. Classic stuffed grape leaves are filled with rice, pine nuts, and fresh herbs. ​Dolmathakia (dol-mah-THAH-kya) may take a little bit of time to prepare, but they are worth the effort. Do not be intimidated by the process of making grape leaves, either. After a little practice, you will be rolling and stuffing grape leaves like a pro. This simple and rustic vegetarian stew made from chickpeas is a specialty of the island of Sifnos, Greece. Before you begin this recipe, it is important to thoroughly soak your chickpeas overnight to get hydrated, tender beans. However, if you are short on time there is a quick-soak method that will only take an hour to prepare. The Greek meze (meh-ZEH), or appetizer table, would not be complete without this creamy carp roe spread. This richly flavored spread is enjoyed with pita bread and is a traditional favorite of the Lenten season. Many vegetable dishes like this green bean and tomato casserole are cooked with olive oil and tomatoes. They are referred to as ​lathera (lah-the-RAH) in Greek because the key ingredient is flavorful olive oil, or lathi. Skip the sprinkling of crumbled feta cheese if you want to strictly adhere to fasting guidelines. Briam is an oven-roasted vegetable casserole that can be adapted and customized with whatever vegetables are in season. Layers of vegetables are baked in a savory tomato sauce and served either as the main meal or as a tasty side dish. The Greek word orphana means "orphaned," and when used in Greek cooking, it usually means a dish can be made without meat. These meatless stuffed cabbage rolls can be delicious as a main dish, but if made with smaller cabbage leaves they can also be a great side dish or appetizer. Cabbage is a favorite winter food, and this meatless recipe is a delightful Lenten favorite. These meatless rice-stuffed vegetables are so delicious that you will never miss the meat. They are stuffed with a mixture of rice and vegetables, and are easy to freeze and be used another time—just make sure you defrost in the refrigerator for three to four hours beforehand. This simple potato ragout is stewed with tomatoes, onions, garlic, and seasonings to create a hearty and warming dish that is perfect for cold, blustery days. Serve with a slice of crusty bread or a side salad for a complete meal. 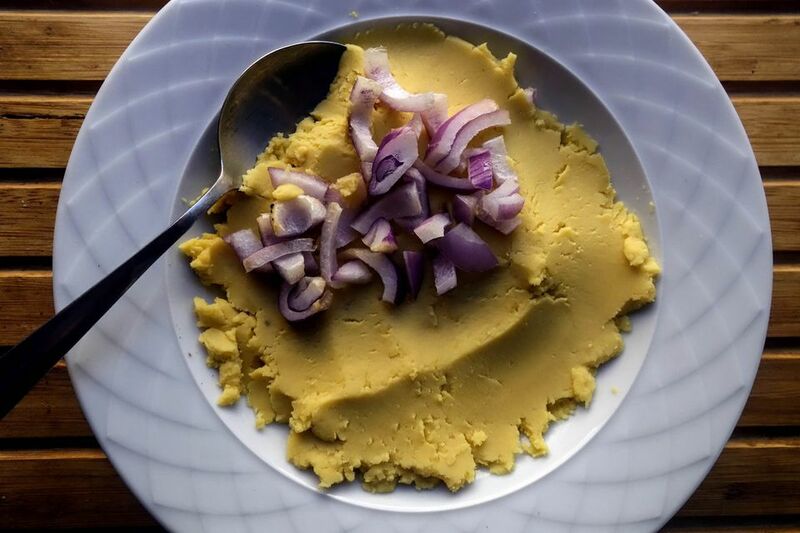 Fava is made with yellow split peas (or yellow daal) and puréed to create a light appetizer that, during Lent, goes exceptionally well with salty dishes as well as dark leafy greens. Outside of Lent, this is also a great dish to make for vegetarians and vegans. This cheeseless Lent-friendly version of a classic spinach and herb pie is just as popular. Although the name for this dish is often used for the spinach pie with cheese, traditional spanakopita does not include cheese. Made with other greens, this pie is called hortopita. These classic bell peppers are stuffed with bulgur, tomatoes, and basil. Bulgur (also spelled "bulghur") is partially hulled wheat that has been soaked, steamed, dried, and then crushed. A popular replacement for rice, bulgur cooks quickly and has a wonderful nutty flavor. Serve this delicious filling stuffed in your favorite colored pepper for an even more festive treat.